Carter was out of town this weekend. He went to the ACC Championship in Charlotte. So, naturally, what did I do? 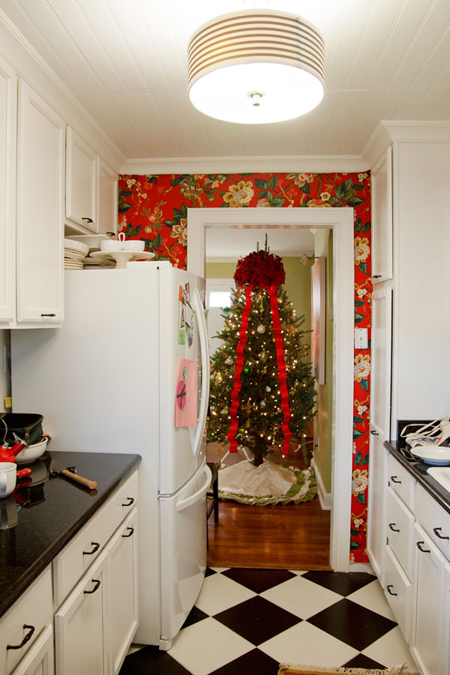 I wallpapered our kitchen. With fabric. Without telling him. I have a partner in crime when it comes to anything crafty/designy - my coworker/designer/friend/teacher Crystal. This girl is amazing...she is also a photographer and the photos you'll see in this post are her doing (and they are boring DIY pix...I'll show you fun pictures she took later this week). Anyway, she and I schemed up this plan a while back and I was so happy to put it into effect this weekend. After reading a couple of how-to tutorials online, namely this one and this one, I felt pretty confident the two of us could tackle this. 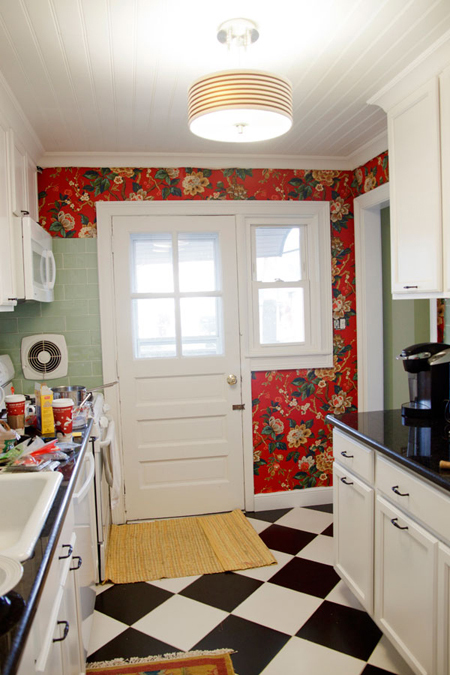 Y'all know I've been toying with all sorts of wallpaper ideas for the kitchen, but I had not come across anything that I passionately loved. 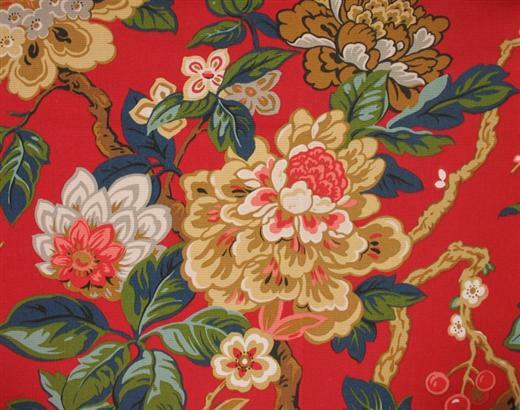 The fabric I ended up using was Waverly's Formosa in Campari. I had seen this fabric but it wasn't until I saw a post from Camila a while back that it sprung back to my frontal lobe with fury. The red looks amazing against the aqua subway tiles we installed as our backsplash and the infusion of color looks great against black and white. It is also obviously reminiscent of our dear Chiang Mai, but I actually like this fabric more because it's strictly floral (ie. no dragons) and at a ridiculously cheaper price point. Done. I wish I could tell you exactly how much fabric you'll need, but that will depend on your project. I ended up using about 5 yards, but there was a good bit of "waste" in that yardage, as we cut around doorways, etc. It was pretty lumpy and goopy. I was expecting something more "liquidy," but it ended up working fine. It was definitely a thicker paste - some tutorials used this over their fabric as well. If you're doing my method, DON'T DO THAT! This glue dries cloudy and white. That might be because I didn't make it right, mind you, but still. 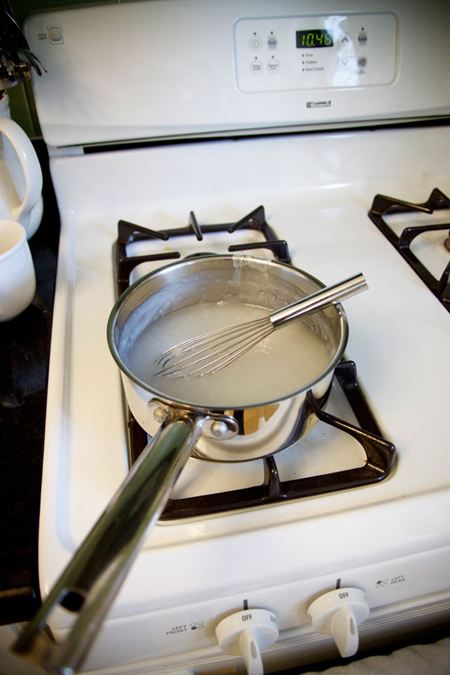 Use the liquid starch for that part (more on that below). Crystal and I also began surveying the awkward wall pieces in my kitchen that we were covering to determine the largest swatch of continuous fabric we would need, and used that area as our starting point. Our first step to begin hanging was to cover the wall with our goopy paste. We used a regular paintbrush and brushed the glue on pretty thick because I was worried my thicker-weight fabric wasn't going to stick so well. I think going heavy-handed ended up being a good idea. Also, my walls were painted with a flat paint, which was a good starting point. If your walls are super glossy or slick, you may want to prime them before you start. Once we had the layer of goop down, we started pressing the fabric against the wall to get it into place, starting from the top. The fabric was heavy, so it took one of us holding/pressing against the wall, while the other either tacked it into place with a couple of lightly nailed-in nails (don't nail in all the way - just a little to hold the fabric) or cut away the excess from doors/windows, etc. As you can see, we left a couple inches of extra fabric around all the edges. This helps keep the fabric tacked up while it dries, and you cut away the excess later with an X-acto knife. Fabric is really easy to place - you have plenty of time to move it around, readjust it, etc - and we didn't have to deal with any air bubbles, really. We just smoothed it out with our hands, pressing firmly to make sure it was absorbing some of the goop on the back. The hardest part of this portion is lining up the pattern, but that actually wasn't that difficult either - and we had a ton of weird slices of wall. If you had a big continuous wall, I imagine this would actually be even easier. I poured the starch in a bowl, soaked my sponge in it, and then went over all the fabric with it. The goal is to pretty much drench the fabric in it - to do so, you have to press the soaking-wet sponge down pretty hard on the wall, which will cause the starch to get ALL over you, your hand and the floor. Make sure you use your other hand to hold a paper towel under the sponge to catch the dribble. My fabric was also pre-treated with some sort of Scotch-gard type protector - which is great for upholstery use, but not so great when I'm trying to soak it with liquid. So getting the starch into the fabric was a little difficult, but I did my best. It also didn't feel as "sticky" as my goop paste - so I'm not sure it did much to further stick the fabric to the wall, but I liked going over the fabric's surface with something to stiffen it and give it another barrier layer on top. Once that's done, you can just sit back and wait. I think my fabric dried in 3-4 hours, but I let it sit overnight just in case. The next morning is when things started to unravel...literally. We have reached the X-acto knife-wielding portion of this event. This is arguably the most "fun" part because you get to slice away the excess and admire your work, but cutting fabric with an X-acto knife at weird angles on a wall is difficult. 20% of the time, the blade sliced right through with no problem, leaving a clean cut. But 80% of the time the blade tugged at the fabric or didn't slice all the way through, so I had to go over the cut several times, creating a jagged edge. And, I was using a new blade. I ended up switching my blade up several times, which looking back I don't think was necessary. I just needed to work on my technique, but in general, this part isn't so easy. I got quite frustrated many times, but I decided to just keep going and in the end, you can't really tell some of the edges are jagged in the kitchen. BUT, I still want to fix it. I'm going to look for some very thin white trim that I can tack against the crown to hide the fabric edge. This is one place where wallpaper wins - the crisp edge of paper is nicer than fabric. 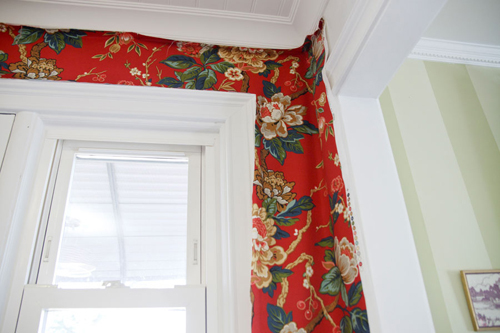 On a positive note, whenever the fabric hit up against door casing or cabinets, we usually had just enough gap behind the casing/cabinet to tuck in the fabric, so no cutting needed! This was definitely a bonus and made for some very clean edges. These photos show the before/after - Crystal took these before the X-acto part, so the edges aren't quite trimmed down here, but you get the idea. Carter walked in Sunday and was very surprised and impressed. I wasn't too worried he wasn't going to like it, but it still made me happy that he liked it so much. And now I can have him help me finish it up to make it look perfect. All in all, I really loved this project. Like all things DIY, I had some hiccups and learned some lessons, but it was pretty simple to do with some great results. Hanging the fabric probably took us a total of 4 hours and cutting it took about 1 hour or so. If you had a lot more wall space, this would obviously increase, but it's still not a ton of time. And the huge bonus of fabric as wallpaper is that it removes very, very easily. You can just peel the fabric off the wall when you are ready to remove it. Or, if it doesn't budge, just wet the fabric to dissolve the starch and you should be good to go. 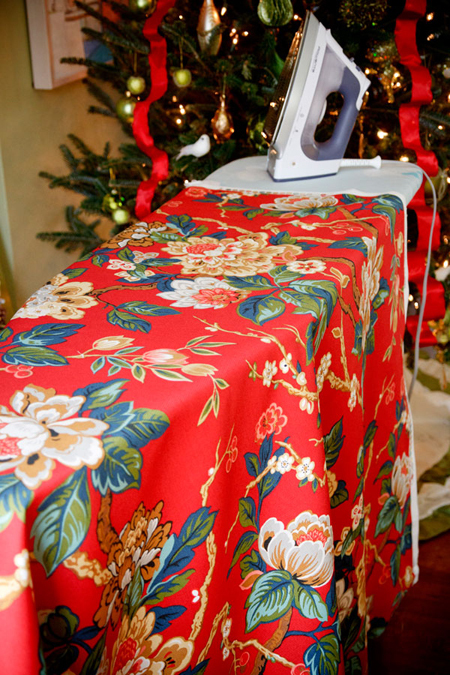 You can even wash your fabric to rid it of residual starch and reuse it. I would not recommend this treatment for very damp spaces, like a bathroom or behind a kitchen sink, but it's a great option for basically anywhere else in your home. Thanks again to Crystal for the helping hand and the picture-taking! 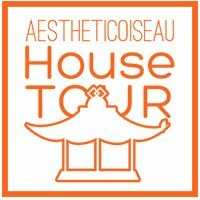 Email me with any questions! UPDATE 2017: It's now 6 years later and we decided to take the wallpaper down...and it came off SO easily. It also held up wonderfully for the 6 years we had it up - it definitely had lots and lots of life left in it. But when it came time to remove, most of it just peeled right off as I pulled very gently. Any parts that seemed stuck, I just dampened to loosen. The fabric did leave debris and some residue on the walls, but that cleaned right up with just a sponge and warm water. Removing the wallpaper AND cleaning the walls took me all of one hour. Win, win. Absolutely Brilliant! This is a definite must! I love this idea! I would have never thought about fabric, but now I want to try asap. That's pretty cool. I've thought it'd be cool to do up a custom design from spoonflower and do it in part of my kids rooms. WOW, that turned out great! I wondered how one would "wallpaper" with fabric.. I have wanted to do this for years and just never have. I wonder if a rotary cutter, like quilters use would work better? Fantastic! I admire your courage to tackle this!! What a pop of color and cheer to now welcome you every morning when you come in sleepy eyed for that first cup of coffee!!! 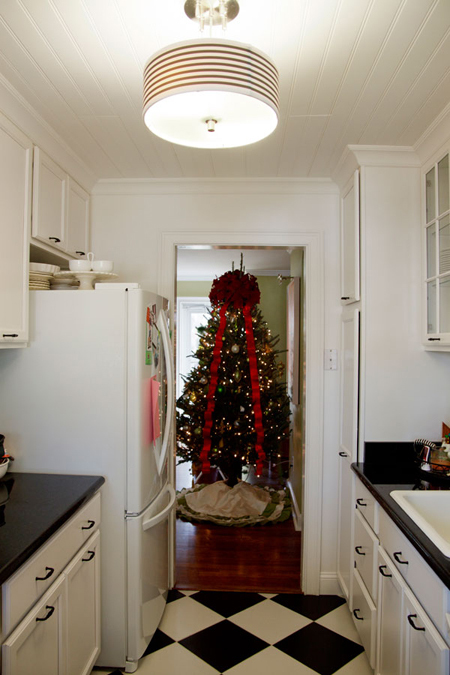 Beautiful ... i also love your tree topper ... looks like poinsettias, can't really tell ... but enough to know I like it! WOW!! I never would have guessed this process. It turned out great. Impressive - the fabric is just beautiful. Thanks for including your troubles, too. Always best to keep it real! Looks great! My wheels are turning. I wounder if it would work on furniture. You did an amazing job! 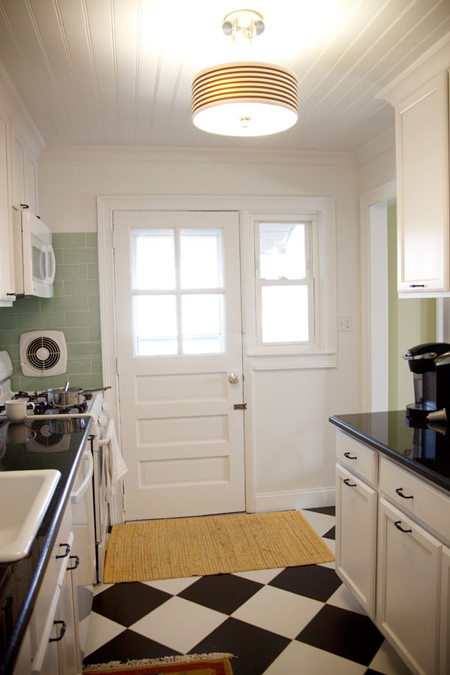 It is gorgeous and your kitchen really pops. Come and decorate my tree... yours is fabulous!!! You are one amazing woman!!! Wowza, what a transformation. It looks great! I've hung paper a few times and I always find it to be sorta hellish, but I always love the result! I adore that fabric, I never would have thought to put it on the walls. Genius! It's beautiful. I love this fabric! I can't seem to find it online for sale anywhere anymore - do you know of a good source or happen to have any leftover that you are interested in selling to a fellow Wahoo? Thank you!! The transformation is stunning! 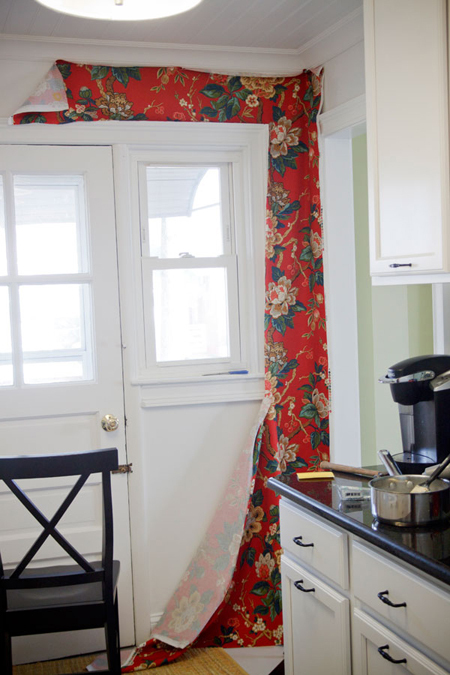 I love how non-traditional your patterned fabric is for a kitchen. AWESOME, STUNNING, GORGEOUS!!! Made me smile. This looks like very expensive wallpaper!!! way to go!